2) Put the measurements in the comments section of the shopping cart or the size section of the fax or mail order form. Note: this is not where you want the nose band to fit; but, it is a good indicator of the correct size. 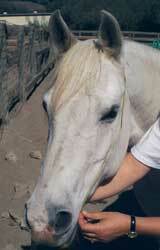 Another view of measuring around the horse's nose at the base of the jaw. 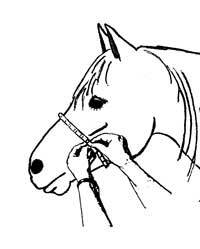 Measure around the throat latch. Note: this measurement should be loose not tight. 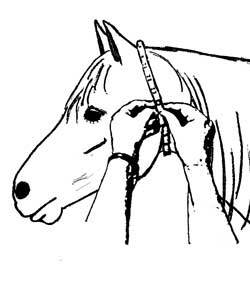 Measure around the horse's poll from the edge of the mouth on one side to the edge of the mouth on the other side. 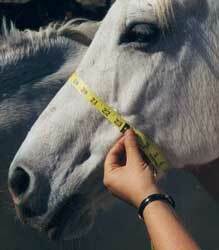 Note: This measurement is only necessary for horses with very large or very small heads.